19th January 2013, the winds are blowing; the snow is on and off again, and it’s brass monkey weather. Perfect for a BrewDog barbeque and party. Suzanne Kelly reports. 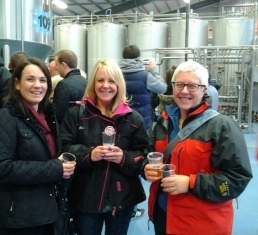 The opening of the shiny new BrewDog Brewery near Ellon was marked by one of those types of events Martin and James, BrewDog’s founders, are now famous for. Around 200 shareholders (Equity Punks as they are known) were chauffeured from the eponymous Aberdeen bar to the factory and back again for four hours of factory tours, music from The Little Kicks (an act which is really getting stronger all the time), speeches, a great but cold barbeque, and of course, beer. On the way up, one of the passengers, Curtis, explains that he’s come up from Glasgow for the day to be here. 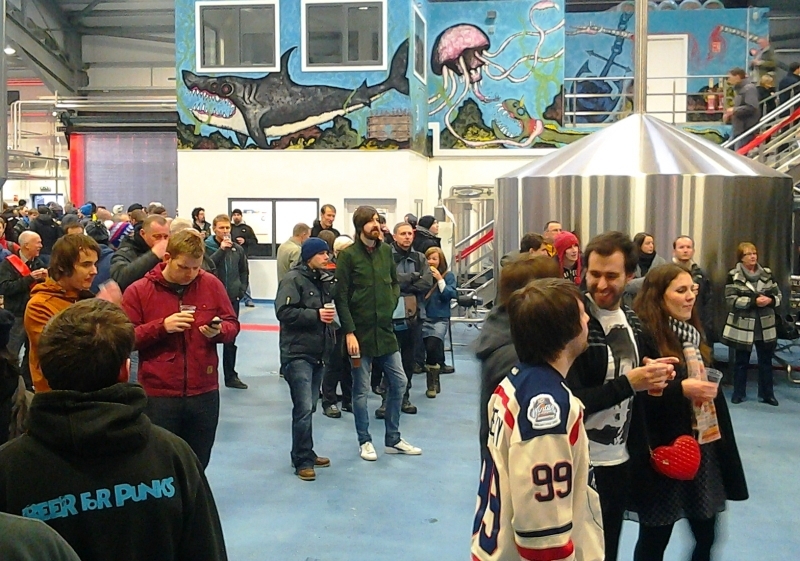 Like virtually all Equity Punks, he bought shares because he loves BrewDog beers. “I love BrewDog. It’s not about getting hammered on cheap lager.” – a sentiment many echo. The success of the brand was explained one month ago by James, who spoke to shareholders up and down the country at small venues; his presentation on the company’s growth was impressive and reassuring. At these meetings shareholders demonstrated great enthusiasm for the new brewery – a project undertaken because demand has far outstripped supply. The old premises are being kept for ‘experimentation’, something this firm excels at and clearly revels in. As to the new factory and its equipment – I can’t tell you how it all works. However, massive quantities of water meet massive quantities of quality hops in massive stainless vats, turning into beer. Dials whirred; computer touch screens flashed, some valve was emitting bubbles. It seems that experimentation is built into the new factory; there are bespoke pieces of equipment including a ‘hops cannon’. The factory is in part painted with an undersea motif, and a neon sign proclaims: “Love Hops And Live The Dream”, which is just what founders James and Martin are doing. Their dedication to craft beer brewing continues to win fans and new partners the world over. There are frequent competitions, give-aways, experimental new beers, publicity happenings and events. The marketing is punk, friendly, and filled both with enthusiasm and a genuine, infectious passion. The brewers were on hand to explain their craft; hops experts were on hand to discuss the finer points of choosing hops. The heroic efforts of the outdoor barbeque crew cannot be underestimated; long queues for the barbeque never abated through snow, snow, rain, snow and rain. The tour ended with a visit to the warehouse end of the building, where walls of cases of beer and golden kegs stamped with the BrewDog logo were met with awe. It was a cathedral of beer to me. The highlight was the cutting of a hops-laced red ribbon by a shareholder named Winston Hamilton (he asked me to thank BrewDog for a great day out for him). 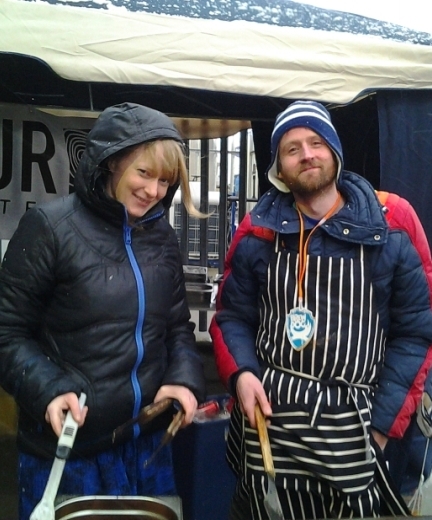 He had been selected to cut the ribbon for his participation in a BrewDog competition. James and Martin each said a few words before the ceremony, and the crowd was delighted. So, congratulations to this creative local success story, and here’s to the next chapters in its future. Note: I own shares in this company, which I have always been very open about and proud of. I’m not extolling the virtues of this company to get others to invest. In fact, you can’t invest now, anyway. I bought the shares not for any hope of rolling in money (I have the smallest amount of shares that you could buy, worth less than £100), but to support a local fledgling business, one with a great product and great people. I think it’s safe to say that many other shareholders feel as I do. 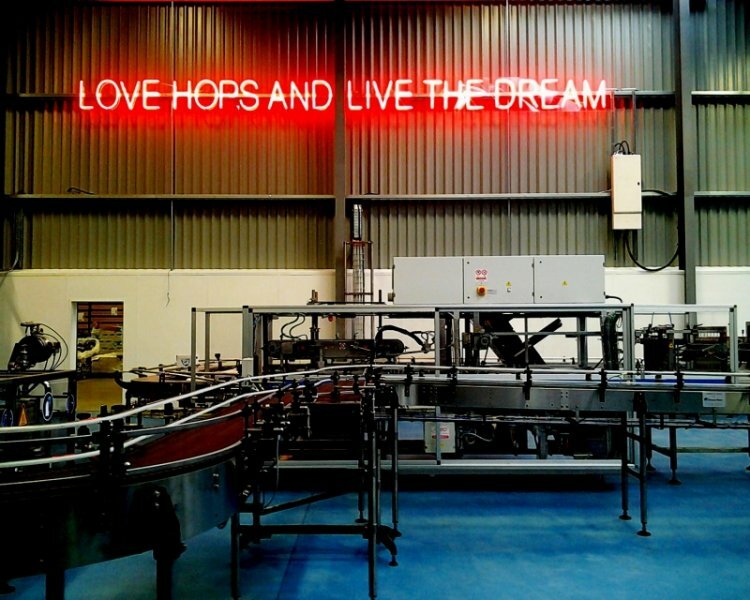 BrewDog: Beer – Enthusiasm – Love.